Interesting limited run kit of this WW1 tank! During the first World War, Great Britain developed the first mobile bunker. The steel monster could move around the battlefield and bring its guns to bear on virtually any target. The unique track design provided enough horizontal and vertical displacement to move around or across the trenches that criss-crossed the battlefield. The code-name for this rolling bunker was "water tank", which later was abbreviated to simply tank, and thus a name was born for future members of this armored family. The Mk.V was initially developed in two classes, one with large side sponsons that housed six-pounder canons, the other with smaller sponsons that housed machine guns. The big-gun/big sponson Mk.V was referred to as 'Male' and the machine gun-equipped Mk.V was the 'Female'. At some point in the war, a number of 'Females' were modified with one large sponson and canon on one side and retaining the smaller sponson on the other. This mixture of 'Male' and 'Female' attributes led to the name 'Hermaphrodite' (clearly the engineers had too much free time on their hands). 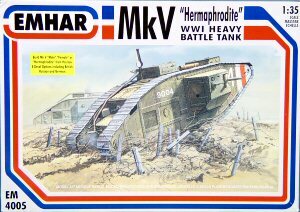 Emhar has just released the Mk.V Hermaphrodite in 1/35 scale. 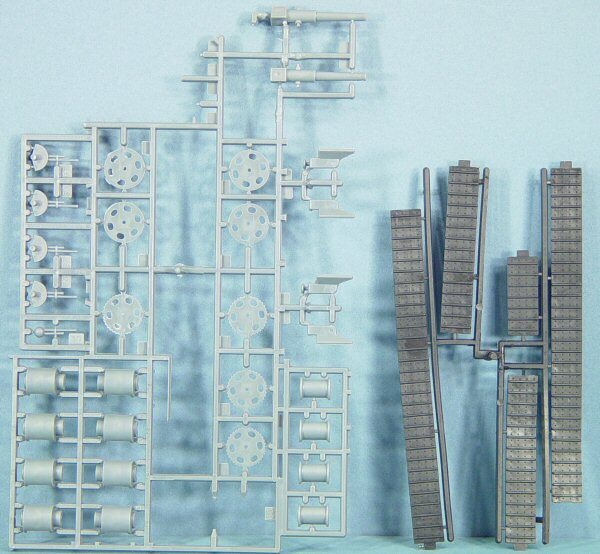 Molded in medium gray styrene, the kit comes on six parts trees plus two sets of track molded in black. 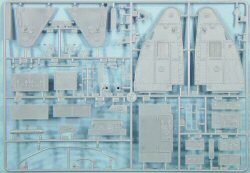 From what I can gather from the instructions, you have sufficient parts to build the Male, Female or Hermaphrodite Mk.V tanks. While five of the parts trees are common to the previous releases of the Mk.V, the last part tree photographed below is new and provides the parts unique to this project. 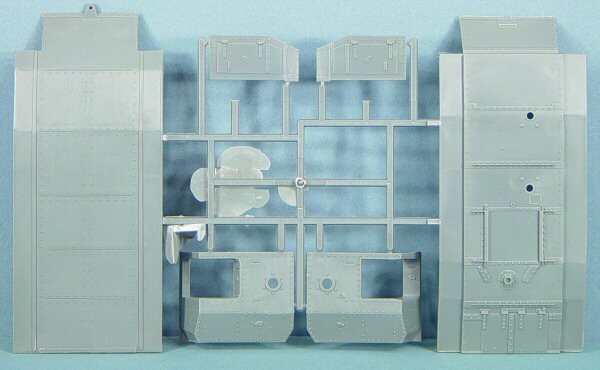 One of the warnings in the kit was to advise that the empty parts areas on some of the trees (such as the tree in this photo to the right) are not lost parts, these were blanked off since they weren't needed in this version. 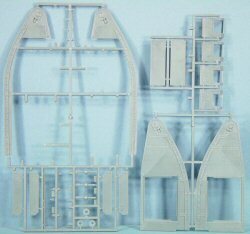 Even so, there are still a few parts that will be available for your spares box when you're finished. 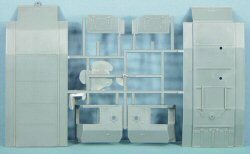 When you delve deeper into the instructions, you'll see that this version of the Mk.V is a conversion to the earlier releases and you'll have a few parts to modify in order to integrate the parts from the new parts tree in this set. While I've marked this kit as an intermediate skill level project, you shouldn't have any problems with assembly if you take your time and dry-fit your parts and subassemblies often. 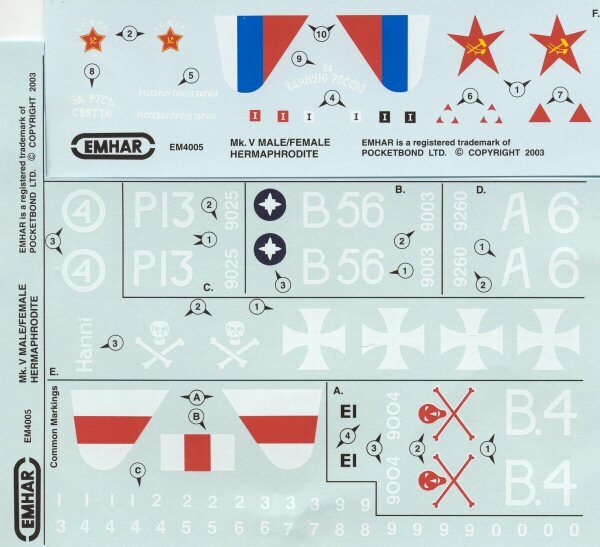 This is an interesting kit from Emhar. The options in the kit provide you with three variations of the basic Mk.V as well as a variety of markings. Recommended!